Time to spill the beans about what the fuss is all about regarding ToyWatch, the watch making company. Time and fashion are blended together by Mara Poletti and Marco Mavilla. Trendy yet with accute attetion to detail, mixing various materials to create anything to cater to anyone who wants to be noticed. The blue Mother of Pearl one is from the Chrono Crystal Collection, also known as the Chrono Mop on some sites. The black one is from the Crystal Collection, very chic. The Crystal Stone Bazel style is currently my fave, because of the clear polycarbonate strap, the black watch face and mineral crystal outer circle around the watchface. It all looks very edgey and I like it. The Skull Oldstyle, with the clear polycarbonate strap, clear mineral crystal face andblack skull and crossbones in black mineral stones siianother fave from the previous colletions. 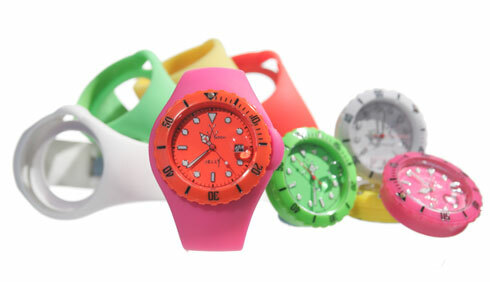 ToyWatch have recently brought out the new Jelly Watch Colletion, where you can mix and match the colours to your hearts content by swapping the watch face with different straps. Not as sparkly as the styles mentioned here, but its still fun. I myself have bought a rubber watch on a recent trip to Milan. It’s a thin purple strap with a small digital time display, and it looks more like a bracelet ot accessory than a watch, which is what I like. Which ToyWatch would you wear?